Transcription services are two a penny. A quick Google search brings up hundreds of providers with results appearing right down to the last page. Because of this, selecting the right transcription service provider can be challenging if you don’t approach it systematically. One of the first steps to getting it right is to have a clear sense of what your requirements are. Is time or cost-efficiency most important? Do you have a stand-alone file or a bulk project? Are you after run-of-the-mill transcription services or looking for value-ads to bring about efficiencies in your business? Different transcription service providers have different strengths and weaknesses. Looking at their websites will give you a fair idea what these are. In addition, you can send an enquiry for specifics. First and foremost, make sure you carefully assess the quality of services being offered. A minimum of 99% accuracy is essential for reliable transcripts. 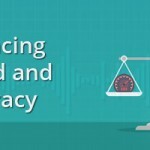 If they do advertise high accuracy, find out how they are able to guarantee it. For example, look at how robust their quality-control processes are and whether or not they are ISO-certified. 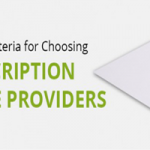 Does the provider give a combined price structure for all the services offered? Or are there hidden costs attached depending on which add-ons you choose? The more variable the pricing, the harder it will be for you to decide what you can and cannot afford. Does the pricing seem realistic? Some vendors like to push incredibly cheap per-minute rates. However, whether they’re actually able to guarantee quality and accuracy is anyone’s guess. If you do take the cheapest option, you may end up having to spend out on a second provider or waste your own time re-doing it. It’s important that your transcription service provider has rigorous internal processes. This ensures they are able to preserve the confidentiality of information contained within your audio files and prevent the leakage of any sensitive data. For peace of mind, only choose a provider that has ISO Information Security Certification. Another important thing to consider is the qualifications of those who will be working on your file. The best transcribers will be native language speakers, subject matter experts, top university graduates and trained quality analysts. Their experience will enable them to pick up on the softer aspects of transcription such as dialects, slang, colloquialisms and other cultural nuances, improving the overall quality. If your projects are sizeable and you are looking for bulk transcription services, it’s important to pick a provider who has this type of experience. 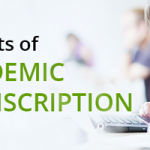 If you choose one that doesn’t, your transcripts may be delivered late, or with errors, due to their inefficiencies. Yet another factor to consider when choosing a transcription service provider is their ability to verify who they say they are. Look at examples of their previous work to see what they are capable of. In addition, read the referrals and testimonials on their website, as well as on third-party sites. Finally, before you make a decision, check to see if they provide any supplementary or complimentary services. 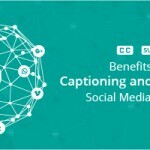 Working with a provider that offers other language services such as proofreading and copyediting, translations, and captioning and subtitling can be very handy and more cost-effective. 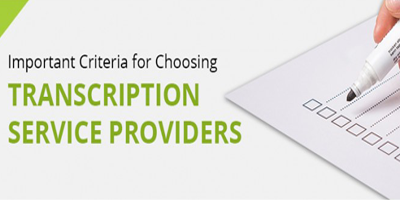 Choosing the right transcription service provider may seem like a tough task. However, by spending some time doing sufficient research you can ensure both the security of your data and the quality and accuracy of your transcriptions – and save yourself time and money in the process.